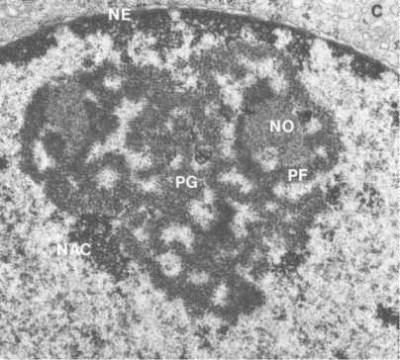 See Alberts et al, Molecular Biology of the Cell, "The Nucleolus is a Ribosome-Producing Machine", Garland Pub., 1994, pp 379-382. The nucleolus is organized from the "nucleolar organizing regions" on different chromosomes. A number of chromosomes get together and transcribe ribosomal RNA at this site. The nuclear organizing (NO) regions are seen as circular areas (pale) surrounded by a rim of electron dense filaments. 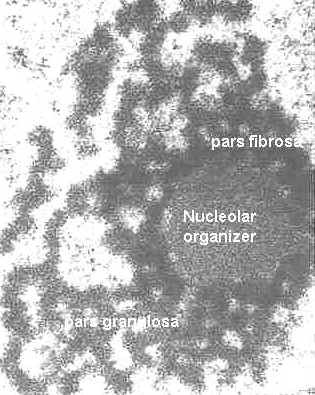 These filaments collectively are called the pars fibrosa (PF). This is formed from newly transcribed ribosomal RNA. This diagram shows the parts of the nucleolus. After the ribosomal subunits are in the cytoplasm, they are connected and then, they may attach to endoplasmic reticulum. They provide an attachment and "code reading" site for the messenger RNA. If they attach to rough endoplasmic reticulum, they form a pore that moves the newly synthesized proteins into the cisterna of the rough endoplasmic reticulum. One can study synthesis of ribosomal RNA with the electron microscope. A preparation of nucleoli is dissociated and spread on a liquid surface (in a manner similar to the spreading of chromatin). 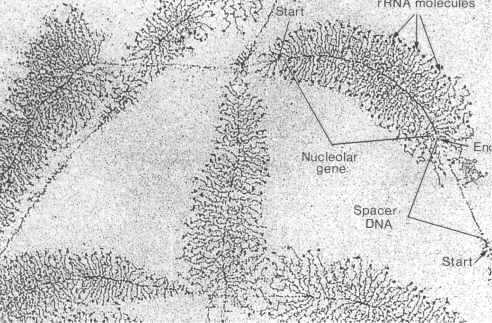 Then, the synthesis of ribosomal RNA is stimulated and after a period of time, the DNA from the nucleolar organizing region begins to look like a Christmas tree. The top of the tree is the start site. As you move down the "tree", the branches appear longer. Each branch is a growing strand of ribosomal RNA. The DNA code is being transcribed and the nucleotides added to the growing RNA strand. Taken from Bloom and Fawcett, A Textbook of Histology, Chapman and Hall, 1994, Figure 1-17. For more information about the process, see the web site describing ribosomal functions.